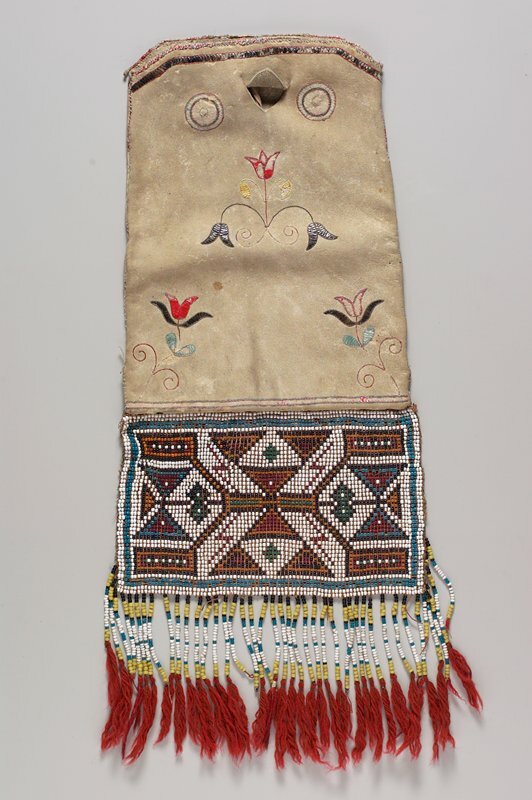 This bag is all that remains of the extensive collection of Indian objects gathered by Major Lawrence Taliaferro, Indian agent at Fort Snelling from 1819 to 1839. Taliaferro tried to keep peace between the Anishinabe and the Dakota who lived in the area and made certain both groups were treated fairly by the whites. This object may have been a gift to him from the Anishinabe. It was made at a time of artistic transition, when established styles of quillwork on leather were being combined with the new beading techniques. The geometric patterns in the beadwork are characteristic of art found in the western Great Lakes region. The bag was most likely used to carry things necessary for smoking, such as flint, a pipe and tobacco.